Since April 2016 (when this website was set up) and the time of writing (November 2017), a planning application has been refused, and an appeal against that decision has been dismissed. The Farmhouse sale is off, and since the Council have to re-think, we wish to focus again on what we've always wanted - a sensible and secure future for Comiston Farmhouse. Hence, this website will be/has been updated. Not wanting to erase all that was published on the site up to this point, most of the "recent history" (text and images) relating to this troubled period will be/has been moved here, as an archive... and as a reminder of what we have all been put through. Everything below this line is archive material. In the autumn of 2017 Edinburgh Council asked a Registered Social Landlord (RSL) to assess the site for development (with retention of the farmhouse) for social or affordable housing. However, around March 2018, after due consideration, the RSL decided that the site was unsuitable for its purposes. Residents had a meeting on 18 April with Council members from the Estates Dept and were told that CFH would now be sold as a house on the residential property market via an estate agent. Particulars will be drawn up soon. (For history of the farmhouse see "Farmhouse History". If you would like to see the webcast of the meeting click HERE, then on the r.h.s. find Item 6.2(a) and click "Watch"
(or drag the webcast progress slider to 2h55m00s and watch from there). (You can view the APPEAL DECISION NOTICE by clicking HERE [PDF], or visit the DPEA website). The instructions below are retained in case they become useful for a subsequent round of commenting. It's advisable to read CEC's Guide to commenting on a planning application (PDF, 140.5KB). Add your email address, and ask to be notified of changes. Mail your letter using a signed-for method, then track it online to prove it has arrived (or if hand-delivered, get a receipt from reception). (B) By Email: Prepare your email and any attachments (include the same reference information as for a paper application... see below). Email them to: James Allanson james.allanson@edinburgh.gov.uk. Ensure that you receive an acknowledgement. Head of Planning and Transport, PLACE, Waverley Court, 4 East Market Street, Edinburgh EH8 8BG. Comments on the following WILL BE IGNORED (have no effect one way or the other): loss of private view • effect of the development on property values • building regulation matters • racist remarks (or similar, which may be reported to the police). Comments are not confidential, so please write them as if they will become public (we believe on the "Comments" tab of the application's Portal page). CEC's Planning Helpdesk (Mon-Fri 9am – 1pm): Waverley Court, 4 East Market Street, Edinburgh EH8 8BG. Call the Case Officer assigned to the application, James Allanson: 0131 529 3946. Around 6 residents lodged applications to have the farmhouse "Listed". We received news on 31 May 2016 that Historic Environment Scotland will NOT grant it Listed status (see Decision documents on Historic Environment Scotland's website HERE). Anyone interested in seeing what was involved can visit this Historic Scotland page to see what is/was involved. If anyone can think of additional material information that could form the basis for an Appeal, please get in touch. In a tremendous response to this planning application, 236 people commented on the original application (Objecting; 234), and for the revised application the count has risen to 326 (Objecting; 322). To view the list on the "Comments" page of the CEC Portal, click here. If you are interested, by Clicking Here you can register to be notified when committee agendas, meeting papers, reports and minutes published online on the CEC website. This is the best way to be kept informed in advance (for any planning application). Click Here for a list of meeting dates and which councillors sit on the Development Management Sub-Committee. Click Here for the general "webcast" page where you could watch the meeting live online or watch it after the event (or HERE for the DMSC meeting of 19 April 2017). Comiston Farm House sits in walled grounds at the junction of Pentland View, Pentland Drive and Swan Spring Avenue, in Comiston. To the postie, it is 83 Pentland View, EH10 6PT. To many young people and staff of Social Work Department over the years, it was Pentland View Close Support Unit. To residents of Comiston and children who walk past it daily on the way to school or to the park, it is an essential part of our local heritage, and a place to look out for wildlife. 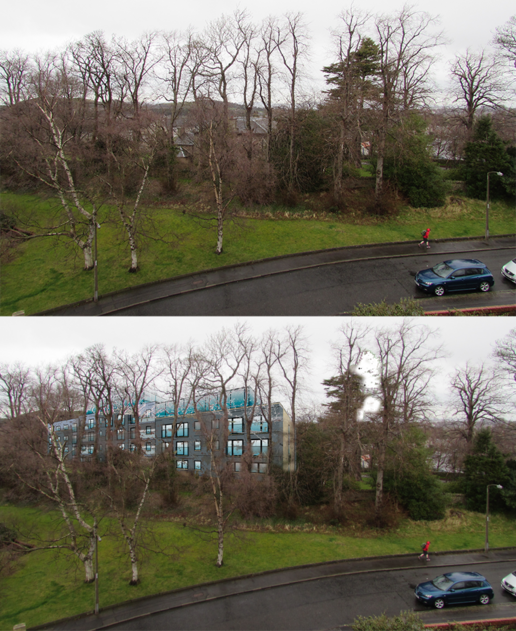 This much-loved house is now under threat of demolition: a planning application has been lodged to demolish the house, cut down the trees in front of it, (including 2 lovely cedars and 3 lime trees, reckoned to be at least 100 years old), and then build 4 blocks of 5-storey flats on the site - 37 flats in all, with attendant car park space, all squeezed into a little over an acre of ground. Five storeys will tower above the present house roof level, and over neighbouring properties. This is already an elevated site, so 5 storeys will change the skyline. Such a dense development will also have a huge impact on local road and traffic conditions, increasing the hazards for the children. Preliminary plans were presented to around 90 residents at a Community Council meeting in April. Residents were appalled at what was proposed, vociferous in raising their many objections, and are determined both to save the farmhouse and to reject such a dense, unsympathetic and inappropriate development. 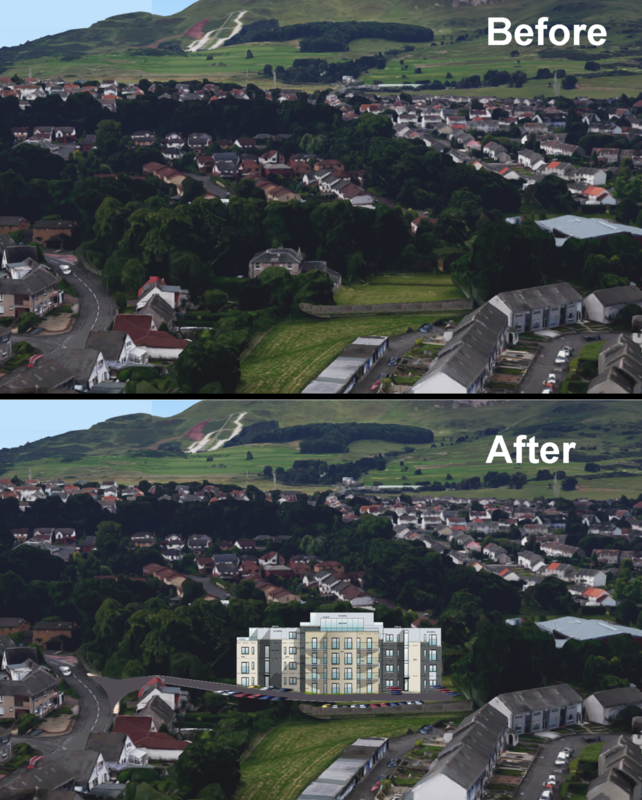 Not only would it mean the loss of a much-loved historic building, a link with Edinburgh’s rural and pre-urban past and a significant part of our historical and cultural heritage, the site is on the walk-to-school route to the nearby primary school. This route includes negotiating the junction comprising of 3 roads, the footpath to the local park, and the access gateway to the farmhouse site. This is already potentially hazardous, especially in winter, as all approaches to it (including the foot path to the park) are up or down hill, with bends, blind corners and/or summits, and limited sight lines. Adding extra traffic from such a dense development would make this significantly more dangerous, especially for young children. Comiston Farm House came into the possession of the City of Edinburgh Council in 1955, when the last of the Comiston Estate land was sold off, mostly for housing. 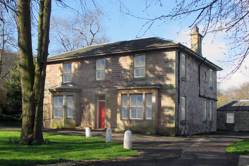 After the last tenant of Comiston Farmhouse (George Harwell, founder of Harwells of Colinton), left in 1978, the farmhouse served as a residential facility under CEC Social Work Department, most recently to assist young people in transition who needed short-term placement. It became ‘Pentland View Close Support Unit’, referring to its purpose rather than its historic name. Two years ago CEC decided to close the Unit and sell the property. Last April it was advertised for sale as ‘An Excellent Redevelopment Opportunity’, but apparently only on the commercial development market, not on the housing market. This is not a brownfield site, and the house is not derelict, though it is currently boarded up (for security), and it is in fact in pretty good shape and could easily be a house to live in again. The sale notice included the statement ‘Despite its age and character the building [farmhouse] is not listed, nor does it lie within a conservation area. The Planning Service has determined that the property is a well-proportioned classical villa constructed in stone and of architectural merit and therefore worthy of retention’. Even so, most of the bids received included demolition of the house. If this house and site had been advertised more appropriately, on the housing market as a prospective residence, it would surely have attracted more potential buyers who would appreciate it and preserve it as a house to be lived in. The current status of the site and farmhouse is ‘sold subject to planning permission’ - that is, still owned by the Council unless and until planning is approved. If enough objections are raised so that planning permission is denied, then this proposal could fall. Historically this is one of rural South Edinburgh’s significant farmhouses, most of which have disappeared under housing developments. It is the only early Victorian farmhouse south of Edinburgh. Recent research has revealed copy drawings of the house dated 1859, and it is now considered highly probable that they were by the architect William Notman, who was apprenticed to, then assistant to, William Henry Playfair. The historic footpath of Cockmylane skirts the perimeter wall to the north and west of the house, and was one of the routes regularly walked by Robert Louis Stevenson between Edinburgh and Swanston. In his day the foot path probably passed between the farmhouse and the farm steadings. Also part of the Comiston Estate, Comiston House (1815) has been sympathetically restored and converted into flats. Its predecessor, Comiston Stables, has also recently been restored and converted into a dwelling house. 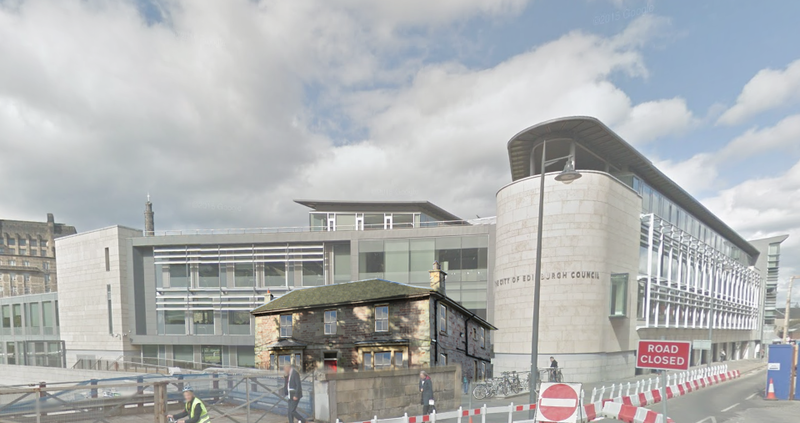 Both of these are Listed buildings. Several Comiston residents applied to Historic Environment Scotland for the farmhouse to be Listed, but sadly it was not granted. Their standards are very high. More information on Comiston Farmhouse can be found elsewhere on this website. Listed or not, it would surely be tragic, cultural vandalism to permit the demolition of a house in excellent condition and with such a historical, agricultural and architectural heritage. View the planning application HERE. (...using the Form below the existing comments). Definitely retain the farmhouse. Ideally it should be restored/renovated as a single family home. If needs be, but far less preferred it should be tastefully converted into 2 or 3 flats as has been successfully done with Comiston House. There could be room for some small development at the rear of the property to make this financially viable, but with heavy emphasis on the small ie cottage style, and this as a last resort. The future of Comiston Farmhouse is a matter of local concern since it is an essential component of our heritage and sense of Place. To the anonymous contributor (Mr B? DB?) it may be only a planning issue; to us it is our cultural heritage, and must be regarded as such. National policy in Scotland, managed by Historic Environment Scotland, on behalf of Scottish Government, insists that older buildings, especially those pre-1919, must whenever possible be restored and reused - whether they are listed or not. There are about half a million such buildings in Scotland They were craftsman built, and treated with respect will last another century. That is what we seek for Comiston Farmhouse. Demolish the farmhouse. No permission is required for that to be undertaken. Planning permission is only required for a new build. I think that most people could not afford over a million pounds for the building and site outright.But I wonder if several parties could financially club together and buy it. For me to be involved, Iwouldneed to sell my home and would need to live there. I realise that that may not suit a consortium.On the other hand, a consortium could have a holistic centre.there, which would a great asset to the community. Keep farmhouse structure, renovate into nice flats/townhouses, re-use or demolish outhouses and replace with in-keeping other residences with nice gardens and adequate parking for the amount of residences. Or perhaps a boutique hotel? Top priority - keep and re-use the house, save all the trees. I'd love to see the House lived in as a family home - to see lights on in the windows again. There are several former farmhouses in South Edinburgh which are great precedents and could inspire someone to make CFH a lovely family home. From what we have seen of drawings the House could be large enough to split into a couple of flats, and there is space in the rear garden to add a couple, maybe 3 'cottages' - so long as they are not as high as the House. The whole could work well as a community house, a small business - maybe a market garden?! A significant constraint has to be he problem of access. There is no safe or acceptable way to insert a new entrance to the site from Swan Spring, so it will be necessary to constrain the level of occupancy to within the safe capacity of the original gateway. it has worked OK for 150 years or so. True, it is part of the Pentland View/Drive/Swan Spring/path to park complex, but the sightlines are as good as it gets round here, and with a Stop line across the exit from the gates it should be no worse than when there were 6 or 8 cars there when used by CSU. Also the bin lorries managed fine through the gateway and using the circular driveway. 1. Retain farmhouse, either for residential use, or for small business use (e.g. charity retreat, dentist, architect, care home). 2. Retain all mature trees. 3. Retain existing access road (i.e. do NOT create a new access road... the plot's use should be able to be accommodated by the existing access road... as per the last 150 years). 4. IF any other development is necessary, roof height to be below that of Farmhouse. Third LEAFLET [PDF]: For distribution to local residents around 12 Feb 2017 after REVISED PLANS were published. Second POSTER [PDF]: Posted around the area after Planning Application was published. Short and Punchy. Second LEAFLET [PDF]: Distributed to local residents around 1-3 June after Planning Application was published. FREEDOM OF INFORMATION: View F.o.I. requests to CEC and responses (if provided yet) HERE.